Project swatches, planning swatches and swatches "just because"
I love swatches, but I confess: I didn't always. There were years I resented the command, considering it time that could be better spent working the pattern. No more. Now I'm an inveterate swatcher -- and not just for gauge. It's essential to my designs. 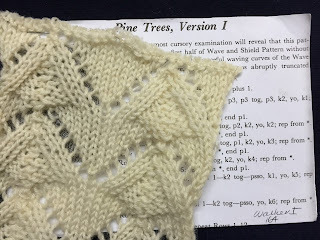 For knitting, I am a huge Barbara Walker fan and her Treasury series of pattern books, a four book compendium crammed full of ideas and possibilities. 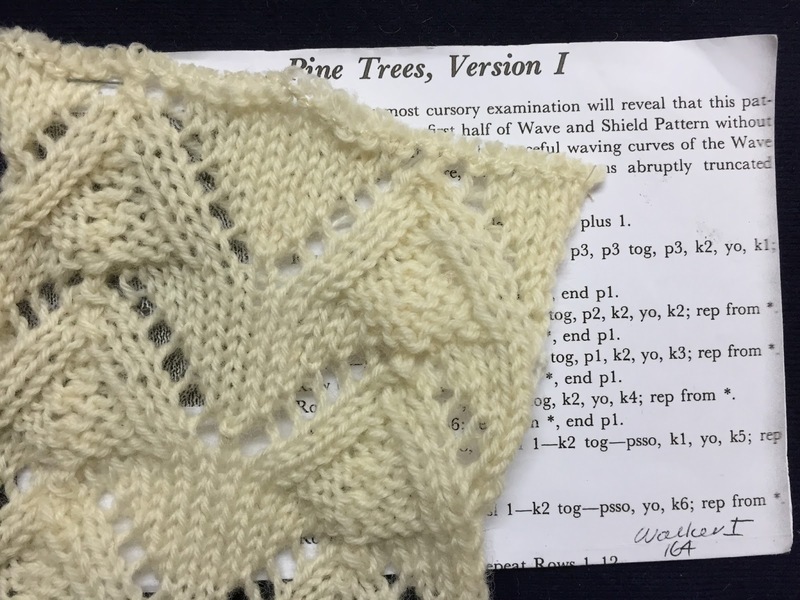 Although a photo accompanies each pattern, the knit swatch often doesn't live up to the photo. Trust me on this one. Periodically, I go through the pattern books and mark the ones that look interesting. I copy the directions and paste each to a 4x6" index card. Then, when I'm too tired to do much else, I'm traveling or I'm between projects, I work my way through my patterns of interest. I like to knit 4 to 6 inch square swatches and label each with the name of the pattern, the book and page number on small white tags. After soaking and blocking them, I attach the cards and they become part of my ever growing library of possibilities. And, yes, I have other libraries, including braids, woven swatches, and dyed yarn. They not only are sources of inspiration and points of departure for projects, but if I've documented the work, I'll have laid the groundwork for what works, what doesn't and yardage. 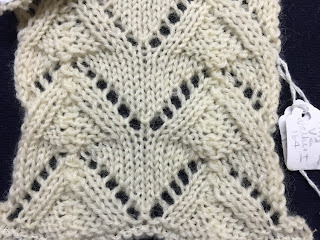 Recently, I've had my head down working on my own knit and braid designs and really needed to just make some thing that required little more than following directions. As above, and in a prior post, I ranted a bit about the need for swatching and what did I just do? I started a project and didn't make one. To be fair, I didn't because the pattern had no gauge. I'm guessing the gauge is based on the standard gauge on the yarn wrapper. A swatch probably isn't essential for the single-size pattern, but I'd still feel more confident in sizing if I were working to one. I added the equivalent of two rows to each square and, based on the measurement of my first square, started knitting. The sweater is working up beautifully, but I'm fairly sure that my gauge is slightly larger than the sample. I didn't worry that it would be too big--she's growing fast--only that I would run out of yarn. I didn't, but just barely. I'm using Koigu yarn in three color variations and oddly, the pink variegated color is ever so slightly larger than the other two. It feels that way in the hand and it's consistently knitting a slightly larger square no matter how tight I try to knit it. The only thing I'm not crazy about are the edges so I plan to add a finish to all the edges. 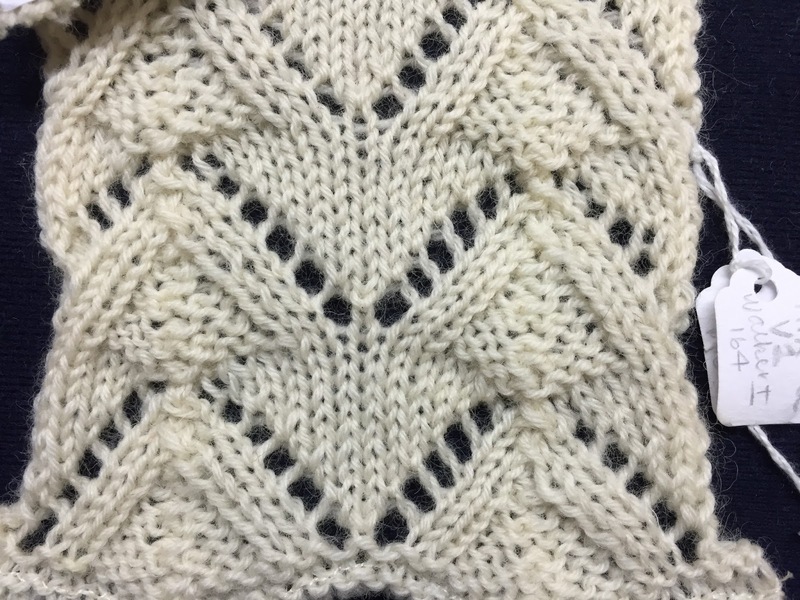 The pattern suggests a row of single crochet, but I'm thinking about an i-cord edge. *Update: I'm putting a double crochet border on the bottom and single crochet on the fronts and neck. Note to self: Even with a pattern, there is such thing as a 'don't-think-and-just-knit-it' project.